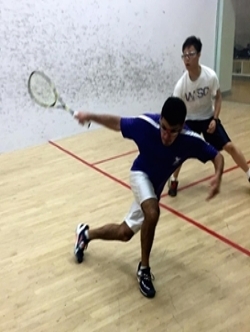 The game of Squash combines fitness, flexibility, and mental toughness. It is a great social sport to meet new people and get a great cardio workout all at the same time. The club is open to all levels, beginner, intermediate and advanced. Don’t be shy because you will definitely find someone to play with at your level. Come out and learn about the sport - rules of the game, tactics on how to play, tips on how to improve your game, and of course learning from playing with others (practice makes perfect!). Remember that this is a recreational club so we want you to come out to have fun and meet some new people! There is no formal coach for this club but our team of execs includes people with a background in squash who will be around to answer any questions you may have or to get on court with you to help or play. Shawn Brady: I have been playing squash for the past 10 years and have loved every moment of it. I joined the squash club in first year, became an executive in second year and now I am a co-president with a great friend of mine that I made through the squash club. I love this sport because it is a great way to meet new people from all types of backgrounds, create new friendships and to get your daily exercise. I am currently in my third year of school at King’s and I am studying Social Justice and Peace Studies as well as French. In my free time I enjoy playing the drums and my ukulele. Spencer Dale: I first picked up a squash racquet 7 years ago during tryouts for my high school’s squash team. Although I did not make the team that year, I stuck with the sport and played on the team for the following three years. Since coming to Western, I’ve been a part of the squash club for two years, and I’ve loved every minute of it. 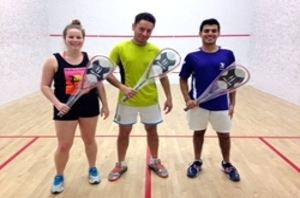 My passion for squash has continued to grow, and I frequently find myself explaining to newcomers how much fun it can be, regardless of skill level. It is also such an effective stress-reliever—nothing else really compares! Outside of squash, I enjoy working out, coding and photography, and I’m currently in my fourth year of a dual degree program with Mechatronics Engineering and Business. Tournaments: We usually hold 2 tournaments a year. One is a closed tournament for squash club members and our second is an open tournament where players of all levels are more than welcome to come and participate. We also spend a lot on some great prizes! Social: We also hold one social every year. As a club we go out to a restaurant, eat, talk, laugh and have a grand time. It is at the social that you get to see your fellow squash club members outside of the sport and in a whole new way! Competitive Ladder: During the year, we organize a ladder where club members are able to challenge each other and try to move up the rankings! Purely optional, of course – but it provides a great way to bring out some more competitive spirit! 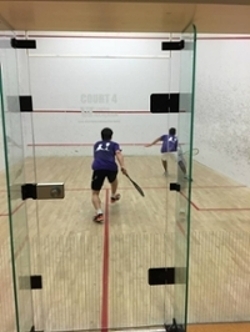 Members will get discounts in the fall and spring semester tournaments and are invited to the other events free of charge, club T-shirts and a good time making friends with whom you can play squash with even outside of squash club. * Goggles are mandatory and can either be purchased for $20, or borrowed from the equipment desk or squash club. Supplies are limited. ** We partner with “OfCourts”, our local racquet sport experts – to provide exclusive discounts for our members as well as amazing tournament prizes! We’ve been working together for a long time, to promote the great sport of squash!